Xi Jinping, general secretary of the Communist Party of China Central Committee and Chinese president, emphasized on Sunday the importance of art and cultural exchanges with the Democratic People’s Republic of Korea. Xi commended exchanges as an important, unique and traditional component in their bilateral ties as he and his wife, Peng Liyuan, met with a visiting DPRK art troupe led by Ri Su-yong, a member of the Political Bureau of the Workers’ Party of Korea Central Committee. He called the visit of the DPRK troupe an important cultural exchange for implementing the consensus reached by the two sides, as well as a significant event in the celebration of the 70th anniversary of the establishment of China-DPRK diplomatic relationship. It will be a great success in cementing the friendship between the two peoples, he added. Xi recalled the four meetings with Kim Jong-un, chairman of the WPK and chairman of the State Affairs Commission of the DPRK, since 2018. China stands ready to work with the DPRK to implement the consensus reached between the two sides on the development of China-DPRK relations in the new era, so as to better benefit the two peoples and contribute to world peace, stability, development and prosperity, Xi said. He called for joint efforts in implementing the consensus on strengthening art and cultural exchanges and cooperation in order to consolidate the foundation of goodwill of the people, carry forward traditional friendship and promote the development of respective socialist cultures. Ri, also vice-chairman of the WPK Central Committee and director of the party’s International Department, told Xi that the visit and art performance represented Kim’s deep feelings toward Xi and the DPRK people’s profound friendship with the Chinese people. The DPRK will earnestly implement the consensus reached by Kim and Xi, strengthen friendly cooperation and contribute to writing a new chapter in DPRK-China friendship, Ri added. Xi and Peng watched a performance by the DPRK artists after the meeting. 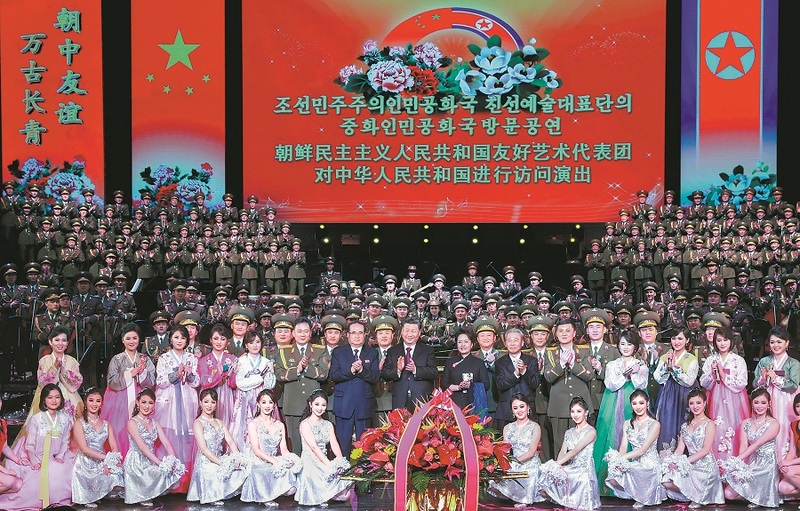 The performance featured songs that are famous and popular in the DPRK and China. The visit of the DPRK troupe was at the invitation of the International Department of the CPC Central Committee. As part of cultural exchanges between the two neighbors, a Chinese delegation of literary and art workers visited Pyongyang in November. They engaged in friendly exchanges and a joint performance with their DPRK counterparts that was seen by Kim.